Hello to everyone fishing this Rio Parana tournament. 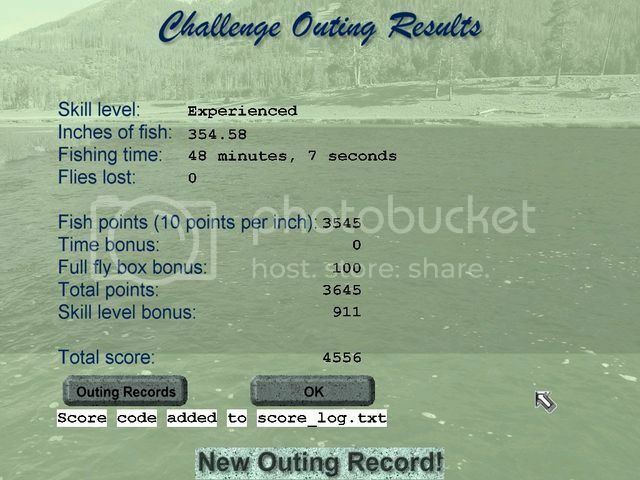 You might look at my time first and say: Wow it took Boston Bob an hour to fish this. Then you will see that I averaged 39" per fish and you know as well as I that you can't horse these big babies in. I lost a monster on site # 9 and on site # 10 I was praying for a piranha....lol I also will be posting on the largest fish site my 46.43 Giant Wolf fish. Thanks to everyone involved in this tournament, all you fishermen and Stanley and Roger for running it. It was a lot of "intense" fun. Congratulations, Boston Bob. What a score!!!!! My hunch was right! Bob turned in an unbelievable score towards the end of the tournament. I am not sure what he did but apparently he had the magic touch! 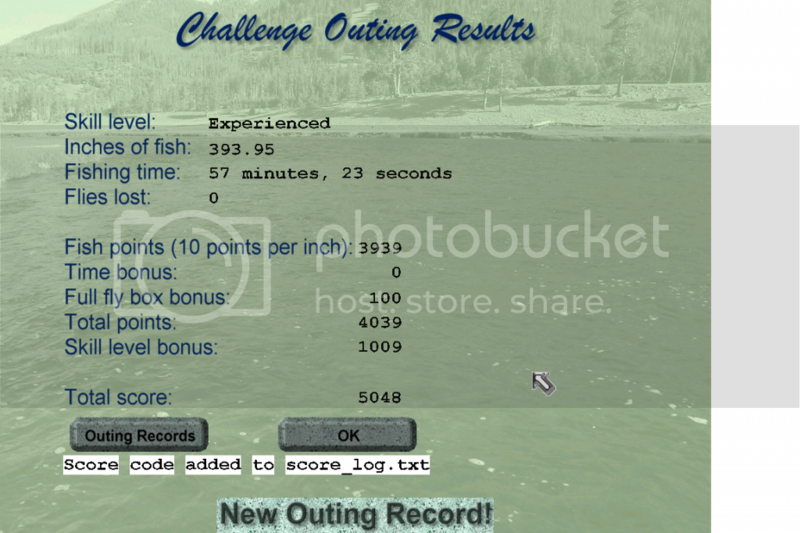 I thought it was not possible to catch all the big fish in the Challenge but apparently Bob had the magic fly. Yes, I did put the Piranha into the outing just to screw things up a little but Bob totally avoided this fish. My hat is off to you and congratulations! However, like the saying goes, "The game is not over until the FAT LADY sings!". There is still a couple of days left for you avid tournaments players to pull off a last minute upset. We still have Barns and Roger lurking in the background and in the past, they proved to be very formidable competitors when the pressure is on. I can wait to see what you guys will come up with during the last 48 hours! A BIG THANK YOU TO ROGER FOR KEEPING TRACK OF EVERYTHING AND VERIFYING THE SCORES!! I hope this hasn't cut into your own fishing time much. I am sure everyone appreciates what you have been doing. Guess what folks! We are now on page 3 on this thread. If we added the original posts in other threads we might well be on page 4. How often do you see a thread like this? Not many times during the past few years. I wish to thank everyone for their support for this mini tournament and their participation! Let's keep the momentum going and we will have a great Forum once again. I will let you go back to your fishing and catching. It will be exciting to see a rush to the finishing post. Good luck everyone! P.s Whether such a result can be improved? Something is not right when a fish snapped you off without you pulling hard on it. This has not happened before. What version update do you have in your RWFF install? I think the V.140 is the last stable version. There were a few bugs in the newer versions and I went back to the V.140 and it seems to work OK. Give that a try and see if you still have the fish snapping off problem. a couple of new members things are looking up. PS: Stanley where do you find version V.140 to download? Paul uploaded his V.139 in one of the threads. You can do a search on the Forum for it. Just input v.139 and some pages will come up. I found this when I searched for v.140 which explains the situation pretty well. Please click on this thread and have a read. You'll get to see a beautiful male Jumping Brookie as a bonus. Like I said in my post, I think the V.139, V.140 were intended for outing developers and the casual fisher should probably stay with V.133 which is a stable version. I tested the new V.141 but it was still pretty buggy. I hope Paul will jump on this one of these days and will release a new stable version for everyone. Please also read Chuck's thread on the version updates on the top of the RWFF Forum. Too bad he didn't have time to follow up when the new versions were released. If I were you I would stay with whatever version that you have now. As they say, "if it ain't broken, don't try to fix it". Hope this will answer some of your questions. Thanks, Stanley. I'll stick with V.133 which I am using now. Male Jumping Brookie a folder does not exist, is this a bug? If so, where can I download - Male Jumping Brookie ? by the time of purchase RWFF. We thank Stanley for great excitement of towing such large fish.